Dawn Spacecraft of NASA is in its final leg journey to meet a dwarf planet, named Ceres. It took eight years for Dawn to reach the orbit of Ceres as NASA expects the event to happen this Friday. Ceres’ size could be compared to that of Texas and is the largest object placed in between Mars and Jupiter. Robert Mase, a project manager at NASA Jet Propulsion Laboratory, summed Dawn’s journey as roller coaster ride that has been an entirely thrilling project. Ceres marks the first of the two planets where NASA will land its spacecraft. NASA’s New Horizons spacecraft is already on its way to reach Pluto in July, another dwarf planet. Dawn launched in 2007, took a break at asteroid Vesta, from where it sent 30,000 images of the asteroid belt. Now, it is headed to the orbit of Ceres, where scientists will get fresh pictures of the dwarf planet. Dawn had transmitted photos of Ceres in December that showed two mysterious bright spot inside of the crater. Scientists will be able to arrive at a clearer picture only after Dawn reaches the surface. Until the mystery is solved, Deputy project scientist Carol Raymond is relating the bright spots to water plumes that European researchers had discovered earlier. The $473 million worth Dawn mission is aimed at studying the evolution of the solar system through gauging celestial objects. Both Vesta and Ceres, surrounded by space rocks, are located in between Mars and Jupiter and could not form into full-fledged planets. Raymond called the two dwarf planets “literally fossils” that will help NASA identify the processes that went into making of the solar system. Dawn spent nearly a year on Vesta’s lumpy surface and will devote 16 months to study Ceres. Unlike Vesta, Ceres is said to contain excessive amounts of ice, which indicate to existence of an ocean below its surface. 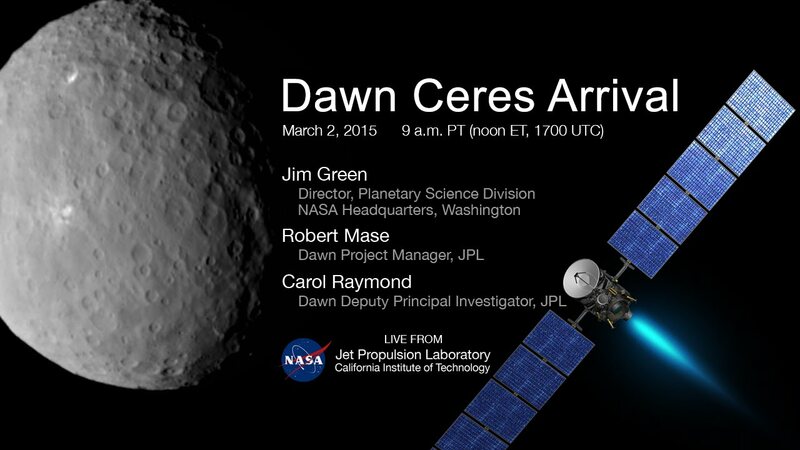 After completion of the mission, Dawn will stay in the lower orbit of Ceres for an indefinite period.